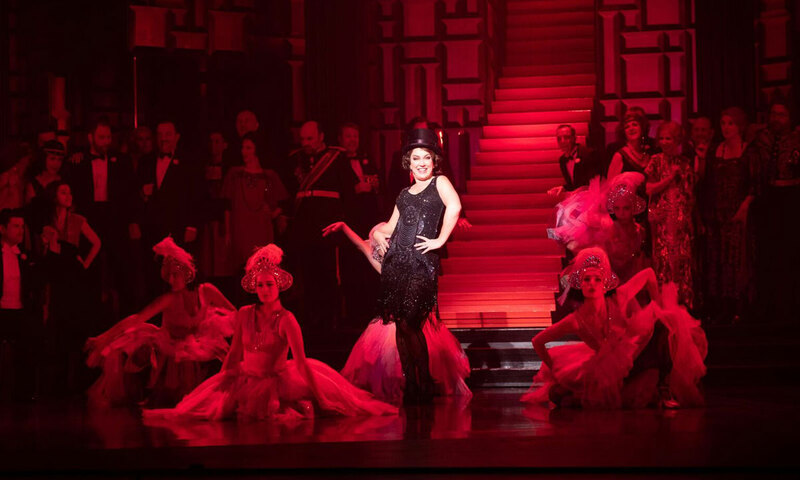 Director and choreographer Graeme Murphy has created a visual feast with this pacy new production of The Merry Widow presented by the State Opera, writes reviewer Greg Elliott. When the curtain reveals the first setting, the audience knows The Merry Widow is going to be a classy act, with detailed gold metal walls and black steps reflecting shards of colour that complement the men’s black suits and gold military braid. It is the first of three picturesque Art Deco sets designed by Michael Scott-Mitchell. Each is superbly lit by Damien Cooper and complemented by Jennifer Irwin’s wonderful costumes, while Murphy’s choreography ensures every moment on stage creates a striking image. This production looks great, the performers are excellent, and the new libretto by Justin Fleming is modern, funny and pacy. Essentially, Franz Lehar’s operetta is about a poor girl, Hanna, who marries a rich man and inherits a considerable sum upon his death – enough to keep the small, ailing Balkan state of Pontevedra afloat. Pontevedrin ambassador Baron Zeta wants to ensure she remarries and keeps the money in the country, but while there is a genuine lover, Count Danilo Danilovich, he’s playing hard to get and she’s playing games. The show begins at a brisk pace with Andrew Turner injecting plenty of energy into his role as the Baron, a naïve twit who believes his wife, Valencienne (Desiree Frahn), to be incapable of having an affair; alongside him, Mark Oates, as Njegus, provides a dry commentary and the occasional witty remark. Soprano Antoinette Halloran is a true talent and is wonderful as The Merry Widow, while Alexander Lewis gives a powerful portrayal of Danilo. The principal singers are impressive in character and voice, creating compelling solos and memorable duets throughout the performance. 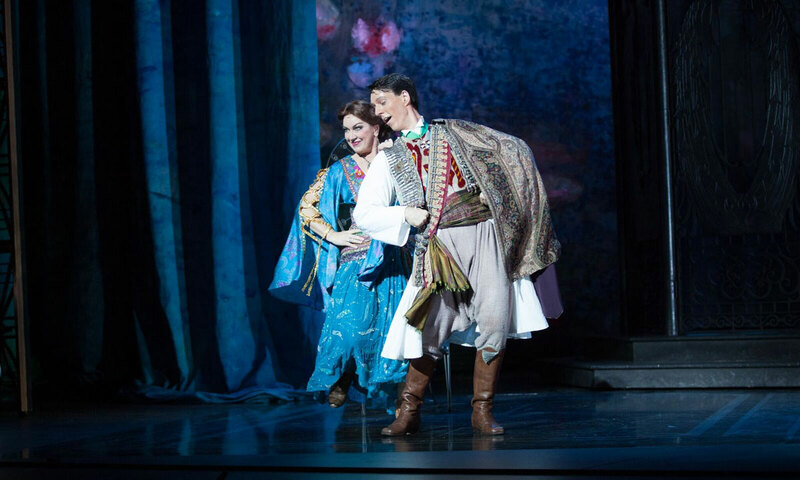 John Longmuir, as Camille de Rosillon, excels as the man desperately in love with a married woman, and the State Opera chorus is choreographed in ways that often make the production feel like a Fred Astaire and Ginger Rogers film. Scott-Mitchell’s set for Act Two, in which Hanna throws a party at her home, is stunning: a beautiful iron summerhouse decorated with peacocks against a Monet backdrop is the setting for dancers in folk costume, with the chorus in summer suits and festive dresses. In the final act, the creative team re-create the sleazy, hazy nightclub setting of Maxim’s in which Hanna and Danilo’s troubled relationship becomes more awkward as he complains about her behaviour with the can-can dancers (reflecting the double standards of the era) before the pair are eventually reconciled. Murphy and his team have created quite a spectacle in The Merry Widow, with its talented singers and dancers accompanied for this State Opera season by the highly accomplished Adelaide Symphony Orchestra. State Opera of South Australia is presenting The Merry Widow at the Festival Theatre until December 6.